W., at home. Portraits of Mr. and Mrs. McCandless will be found elsewhere in this work. 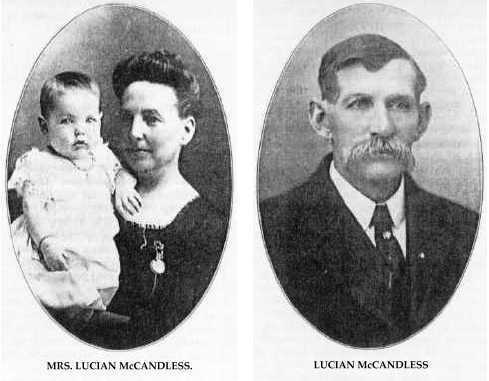 Mrs. Lucian McCandless & Lucian McCandless. in Custer County, Nebraska, in 1882. John Rehder, a prominent farmer and Stockman living on section twenty-nine, township twenty-seven, range one, is well-known in Pierce county, Nebraska, as a progressive and successful farmer and agriculturist. Mr. Rehder is a native of Germany, being born in the village of Etlock, Holstein province, December 2, 1853, and after growing to manhood was a farm laborer, doing what his hands found to do. He is the son of Hans and Anna (Diaron) Rehder; his father was born in 1828, attaining the age of ninety years, and his mother was born in 1838, and died in 1883 in the fatherland. Mr. Rehder emigrated to America in 1884, embarking at Hamburg on the "Harmonia," landing nine days later in New York. He came to Grand Island, Nebraska, where he lived one year, then went to Davenport, Iowa, living there for a period of eighteen months. He farmed at Grand Island for two years, then moved to Rushville, Sheridan county, where he bought the relinquishment to a homestead claim, living part of the time here in a sod house. Later he sold this land, and settled in Pierce county, Nebraska, and bought the southwest quarter of section six, township twenty-six, range two, six miles from Pierce; a tenant now cultivates this farm for him. Mr. Rehder was first married in 1883, to Miss Anna Teterman, and to this union eight children have been born; Lena, married William Schendler, and has two children, Willie and Herman; Emma, now Mrs. William Marscha; Anna, Tille, married Ernst Peterson; Peter, Bertha, Minnie, and Herman. Mr. Rehder's first wife died in 1901, and in 1907 he was again married, this time to the widow of Henry Dehlert, whom she married in Minden, Iowa. They came to Nebraska in 1885, purchasing the first eighty acres at seven dollars, the second at twelve dollars, and the second quarter section at twenty-five dollars - land now worth nearly a hundred dollars per acre. Mrs. Rehder, Anna Merseu in maidenhood, was born in the village of Heide, province of Holstein, Germany, and came to America in 1883. Of her first marriage six children were born, five of whom are living: Herman, Elsa, Emma, William and Walter. Of the second marriage one child was born, named Emil. Mr. Rehder has always taken an active interest in affairs in his locality, and aided every movement for the betterment of conditions in his community. In religious faith, he is a member of the German Lutheran church, and has affiliated with the Sons of Herman since 1899. This gentleman is owner of a fine farm in the North Loup Valley, which is fully equipped with good buildings and improvements. He engages in mixed farming and stock raising, and outside of his home farm, is possessed of other lands located in the vicinity, all of which forms a very valuable estate. Milton Hudson was born in Madison County Kentucky, July 27, 1853, and is the eldest child of David and Mary Terril Hudson, the family living in that state for many years. When our subject was eighteen years of age, he started out for himself, going to Clay county, Missouri, where he spent a number of years, being married there in 1878, to Lulu Wills, whose parents were pioneers in the region. Mr. Hudson, with his wife and one child, came into Howard county, Nebraska, in October, 1883, and here a daughter was born, Lulu, who is now the wife of Earl W. Barns, they living in Raymond, Nebraska. Mrs. Hudson and the elder daughter, Pearl by name, are deceased, the former dying in 1885, and Pearl three years later. In the year of his wife's death, Mr. Hudson purchased a tract of one hundred and sixty acres of land on section thirty-two, township sixteen, range eleven. He worked faithfully, and succeeded in making of it one of the finest farms in the region, still making it his home place, although he owns one hundred and sixty acres in section twenty-six, Fairdale precinct, Howard county. His place is equipped with substantial buildings of all kinds, and he is considered one of the wealthy and progressive men of his section. In 1887, Mr. Hudson was married to Miss Lulu Dale, in Macon City, Missouri. Mrs. Hudson is of a prominent old Missouri family, and a lady of much charm. They are the parents of two children, Oscar and Fay, both living at home. During his early residence in Howard county, Mr. Hudson was prominently connected with the upbuilding of his locality, helping establish the local schools, etc., and has passed through all the ups and downs of pioneer life in Nebraska. George Eberhart who is proprietor of a fine estate in section six, township nineteen, range fourteen, is one of the prominent and successful ranchmen of Valley county, Nebraska. He has made this region his home for over fourteen years past, and is well known throughout the locality as a progressive and up-todate farmer and one of the well-to-do citizens of the community in which he resides. daughters; our subject was born and raised on a farm in Pottawatomie county, Iowa, where his parents had moved about 1887. Mr. Eberhart came from Pottawaomie [sic] county, Iowa, to Valley county, Nebraska, in the spring of 1896, where he first settled in Mira valley, Valley county, and followed farming and stock raising. He is now one of the largest stock men in Valley county, and has a fine lot of cattle. Mr. Eberhart was united in marriage to Miss Louisa Lee in Mira Valley, Valley county, Nebraska, September 10, 1894. She is a daughter of Henry and Martha (Hornicle) Lee, who migrated from Iowa to Valley county some twenty years ago. Mr. Eberhart came from Iowa to be married in Valley county, Nebraska, and returned to Iowa, after marriage, to his farm, but in 1896 moved from Iowa to Mira Valley and bought a quartersection of land. In 1905 Mr. Eberhart bought the east half of section six, township eighteen, range thirteen, where he has a fine stock farm of three hundred and twenty acres, with a large, commodious dwelling, big barn and necessary outbuildings. Mr. and Mrs. Eberhart have five children, namely: Alice, Nellie, Esther, Bessie and George, junior. Mr. Eberbart is one of the younger and newer settlers in Valley county, but is a progressive man along all lines, and closely identified with. the interests of Valley county. Mr. Eberbart's brother Ben joined him about 1904, and now owns and lives on the southwest quarter of section six, township eighteen, range thirteen, and is married and has one child. The other members of the Eberhart family live in Iowa. Samuel Kent, a prominent farmer and stock man living on section one, township twenty-three, range two, is well known throughout Madison county as a progressive and successful agriculturist, highly esteemed by all who know him. Mr. Kent is a native of county Wexford, Ireland, born February 2, 1833, and is a son of Richard and Bridget (Kinshella) Kent, both natives of Ireland; the mother was born in April of 1810, and lived to be ninety-three years of age. Mr. Kent when but twenty-one years of age left his native land for the new world, embarking at New Ross, Ireland, on a sailboat and was on the sea five weeks. After crossing the ocean he first landed in Quebec, Canada, remaining in Canada for six years; in 1860 he moved to Michigan, residing there ten years. In 1870, Mr. Kent, with his family, started for the west, coming by railroad to Des Moines, Iowa. Here our subject left his family and came to Nebraska to find a location for a home to bring his family to. He came overland from Omaha to Norfolk on the mail stage, and after reaching Norfolk he took up a homestead claim, where he now resides, in section one, township twenty-three, range two, as before stated. After locating his claim he returned by stage to Omaha, and from there went to Des Moines, Iowa, to get his family. He returned to Madison county with his family and they took possession of their new home; at first a sod house fourteen by fourteen feet was put up, and the famiy [sic] lived in this seven years. Mr. Kent also took up a timber claim seven miles southwest of the homestead. Columbus was their market place in those early days. Forty years of steady improvement have passed over this section of the country since Mr. Kent first landed in Madison county, and one who has not been a witness of the marvelous changes that have taken place would not recognize this portion of the west as the same locality as that of forty years ago. When Mr. Kent first came to the western frontier, the wild, unbroken prairie had not known the touch of cultivation, nor scarcely felt the pressure of a white man's foot. The pioneer settler had to break the virgin soil by very primitive means and much hard labor. After our subject had broken and cultivated his land and had the crops well started, the grasshoppers came in hordes and destroyed every vestige; this happened the first five seasons of his residence. But Mr. Kent braved all these hardships and discouragements and has reaped a rich reward for his perseverance and thrift - he now owns eight hundred and eighty acres of the finest land in Madison county. Mr. Kent was married July 14, 1858, to Miss Mary Doyle, also a native of Ireland, and Mr. and Mrs. Kent are the parents of ten children, namely: Richard, Samuel, John, James, May, Annie, Ellen, Maggie, Katie, and Matilda. This is a fine family, possessing the respect and esteem of all who know them. They are members of the Roman Catholic church. On January 12, 1888, during the blizzard, two of Mr. Kent's children Samuel and John, were at school. Samuel left John at a neighbor's house and started home, and was nearly lost in the storm, only finding his way home by chance. Mr. Kent is affiliated with the democratic party, and be is surrounded in his pleasant home by a host of kind neighbors and good friends. Among the earliest settlers of Custer county, Nebraska, were the Crist family, and Isaac M. Crist is a native of that county. He is one or the younger generation of farmers to operate in his region and is successful to a gratifying degree. He is one of the ten children of Seth and Eliza (Masterson) Crist, and was born June 12, 1880. He grew up amid pioneer conditions and attended the early schools of his native county. After leaving school he engaged in farming. Nebraska. The Roach family were early settlers of Hamilton county and Mrs. Crist's father, Milton Roach, was born in Iowa and now lives in Custer, as does her mother Mrs. Ora (Smith) Roach. She has three brothers and one sister in the county. Two daughters have blessed the union of Mr. Crist and wife, Audrey and Naoma. Mr. Crist is an enterprising and energetic farmer and follows modern ideas in carrying on his work. He is well known and popular in his community, where he has spent his entire life, and has made his influence felt in public affairs. Mr. Crist cultivated his grandmother's farm six years, consecutively, and had occupied it a year prior to that time. In the spring of 1911 he leased for two years the farm of his father-in-law in section thirty-two, township seventeen, range seventeen, and is interested in farming and stock raising. He is a representative of a prominent family that has long had a good standing in Custer county, and has every reason to be proud of his name and ancestors. In political views he favors the democrats and populists, and fraternally is a member of the Modern Woodmen of America. Among the many self-made men of Nebraska, Knut Henrickson, a prosperous farmer of Cedar county, is a notable example. He came to the county with no capital and with a wife and family to support, took up a homestead and improved and developed it until he now has a valuable estate. He is a native of Sweden, born in Skaane in 1838 and reared on his father's farm. His parents were Hans Henrickson (Henry Hanson) and Christina (Hanson) Henrickson, who spent their lives in Sweden. After being educated in the schools of his native land, Mr. Henrickson engaged in farming and eventually married there. In 1880, however, he decided to seek for larger opportunities for himself and his children, and sailed from Gottenburg to New York, whence he at once set out for the west. He went first to Yankton and Mrs. Henrickson's brother came soon afterwards. They later came to St. Helena and on to their present home on section twenty-eight, township thirty, range one, west, of Cedar county, which has since been the home place. Upon locating in Cedar county Mr. Henrickson took up a homestead, but at first had not one cent to pay for food. The first year they turned the soil with a spade, as they had neither plow nor team. The second year Mr. Henrickson went to St. Helena and worked for money to buy a team and his wife worked for her brother in the field at fifty cents per day, to earn money to help pay her brother three dollars per acre to break ground on the Henrickson homestead. The first few years were ones of hard work to enable them to get a start, but they persevered and kept up their courage until better days came. Many times Mr. Henrickson had to walk to St. James and carry home sack of flour to the family, as he had no team with which to haul it. However, by dint of much hard work and patience he was able to make a good beginning towards the development of his farm and erected suitable buildings and secured good agricultural implements to help him in his work. Mr. Henrickson's marriage occurred in Sweden, in 1866, when he was united with Anna Pars, and they are the parents of the following seven children: Mary, now Mrs. William Case; Henry, Bettie, wife of August Erickson; Alfred, Emma, married to Samuel Case; Lewis, and Bertha, married to Clarence Cressie. Everett J. Crawford, of Comstock, Nebraska, is well known as a banker and successful business man, having helped in the organization Farmers & Merchants bank there. He belongs to a pioneer family and was born in Westerville, August 16, 1885, junior son of Nathaniel J. and Sarah Emma (Woodfill) Crawford, the former a native of Bangor, Maine, and the latter of Indiana. The father was born April 17, 1841, and when but a small boy was taken by his parents from Maine to Jefferson county, Indiana, where he reached manhood's estate. He enlisted in Company A, Fifty-fifth Regiment Indiana Volunteer Infantry, in which he served three months, and re-enlisted in Company L, First Regiment Indiana Heavy Artillery for three years. He received an honorable discharge at the close of the war, having served for about sixteen months as a non-commissioned officer. At the close of the war Nathaniel J. Crawford became a machinist, working at his trade in Chicago, Denver, and other cities. He came from Denver to Nebraska and took a homestead on Clear creek in Custer county, in 1879. This farm was on the southwest quarter of section one, township sixteen, range eighteen, and he set at work to improve it, developing a valuable estate there. He was identified with the early growth and posperity of the region and a man known for his strict integrity in business transactions. go to Kearney or Grand Island for supplies, and, with the exception of a year spent in Westerville, lived there until the fall of 1909, when he located in Comstock, where his death occurred February 18, 1910, survived by his widow and three children, Fred B., the elder son, born on the homestead farm March 23, 1883, a prominent young man of Custer county, married Miss Ena Welsh, April 6, 1910, and they live on the old Crawford homestead; Everett J.; and Miss Twilla, a teacher in the public schools of Comstock. Mrs. Comstock now lives with her son, E. J., at Comstock. Everett J. Crawford finished the common school course, spent one year in Broken Bow business college and one term in Wesleyan university in Lincoln, graduating from the commercial department in 1908. In the fall of that year he took a position in the First National bank at Ansley, and in 1909 helped to organize the bank of which he has been cashier since October, 1909, being also a director. He is one of the best known young business men in the county, of recognized integrity and ability. The bank with which he is connected is a sound financial institution, with a capital and surplus of fifteen thousand dollars. Vencel Krikac is president and J. W. Yockey Vice-president. Since its organization it has shown a healthful and encouraging growth. It is a home bank, owned by local men, the more conservative farmers and business men of Custer county. At the close of the business done October 7, 1909, the first day's business, they had deposits to the amount of eight hundred and fifty-two dollars, and on October 7, 1910, deposits of fifty-six thousand dollars, each succeeding month showing an increase in business. On May 4, 1910, Mr. Crawford was united in marriage with Martha M., daughter of James and Josephine Hiser, born and reared in Custer county, where her parents were early settlers. Mrs. Crawford died at her home in Comstock May 15, 1911, survived by her husband and infant daughter, Marion Martha. Mrs. Crawford was greatly loved by her friends for her beautiful character and fine qualities of mind and heart. Her loss was a great shock to her family and all who knew her. She graduated from Ansley high school in May, 1901, and in 1902 from the Ursuline conservatory of music at York, being highly talented as a musician. Located very pleasantly in section twenty-three, township thirty, range eight, Knox county, Nebraska, is to be found the genial and enterprising young man, Mr. Fred Bolter. Mr. Bolter is well known throughout this community, being a native born son of Nebraska, and his parents having been of the very first settlers of Knox county. Mr. Bolter, as before stated, is a native of Nebraska, being born in Knox county, February 4, 1882. He is the son of Ernest and Mary Bolter both natives of Germany. They left Germany in the early seventies to come to America, sailing from Hamburg to New York City. After landing in the United States they came directly to Knox county, Nebraska, having heard of the cheap land to be procured by the homestead act that had been put into effect, whereby a man could obtain land just for the meer proving up on it. Upon coming to Knox county, our subject's parents took up a homestead on section twenty-two, township thirty, range eight, on which they built a frame house; they also took a tree claim. Here the family experienced the many hardships that were endured by the few very early settlers, the hardships and dangers being much greater in the first days of settlement than later on when the country was becoming gradually more populated. Our subject grew up on the home farm, and well remembers the many experiences of those days on the old homestead. Mr. Bolter was united in marriage May 15, 1906, to Miss Edith Butterfield, and Mr. and Mrs. Bolter are the parents of three children, whose names are as follows: Roy, Leonard, and Vera. Mr. and Mrs. Bolter and family are surrounded by a host of friends and acquaintances, and enjoy the respect and esteem of all in the community in which they reside. James Fletcher Browder, born in Jackson county, Illinois, on September 6, 1848, is a son of David and Margaret Browder, the former being the father of eighteen children, James F. being the seventeenth in order of birth, and of this large family but himself and one brother are now living. The father died in 1855 and his widow followed him seven years later. After his father's death our subject went to Kentucky with relatives, remaining there for about three years, following farm work as an occupation, finally returning to Illinois, and in 1864 he went to Iowa and spent about two years. He again returned to Illinois, and in 1869 went to Iowa, from there to Kansas in 1871, where he spent one year, and then returned to Iowa. In the fall of 1873 he came to Boone county and homesteaded a quarter section about four and a half miles southeast of Albion, later selling his relinquishment. In 1878 he pre-empted one hundred and sixty acres two miles west of his original homestead, and made that his home for about eighteen months, then purchased one hundred and sixty acres of railroad land lying two miles west of Loretta. In 1883 he went back to Iowa and became connected with the Diamond Creamery Company, remaining for one and a half years, then returned to Boone county and engaged in farming and stock raising, continuing in the business up to 1901, at which time he settled in Loretta, where he built a comfortable home and resided until the spring of 1910, when he began renting the farm which he now occupies two miles west of Loretta. Mr. Browder was married on February 1, 1877, to Miss Anna Watson, of Washington county, Illinois, They have a family of three children, William O. and Arthur E., living at home, while Winifred H., now the wife of W. M. Bradbury, lives in Grand Island, Nebraska. Prominent among Antelope county old settlers is P. M. Sodersten, who since the fall of 1884 has made this region his home and who has done his share in the developing of the agricultural resources of this section of the country. Mr. Sodersten lives in section two, township twenty-five, range eight. Mr. Sodersten is a native of province of Dalarne, Sweden, born August 18, 1857 and after growing to manhood followed the occupation of sailor. His father, Olaf Sodersten, was a farmer in Sweden. Our subject left his native land to come to America in 1882 where he could get cheap land, sailing from Guttenberg by steamship. After landing he first came to Will county, Illinois, where he lived and worked on a farm for two years, then in 1884 going to Holt county, Nebraska, northeast of Atkinson on Brush creek, residing there five years. He came to Antelope county in 1890, where he proved up on a timber claim and then bought one hundred and sixty acres south of it, making three hundred and twenty acres of land. From 1890 to 1893, Mr. Sodersten worked on the railroad at Clearwater, then in April, 1893, he went to O'Neill, where he was section foreman until November 6, 1900, he then moved to Clearwater, where he was section foreman until April, 1901. Mr. Sodersten was married April 18, 1888, to Miss Harriet Smith and to them have been born seven children, as follows: Anna, (deceased); Vida, Charles Magnus, Mary, Olaf (deceased); Bessie Caroline, and Perry (deceased). Mrs. Sodersten came to Antelope county in October, 1873, with her parents from Iowa. She was born in Texas, April 7, 1859, and in May, 1871, her parents took up a homestead south of Oakdale, Antelope county, Nebraska. Her father was a native of New York, and her mother also of New York but the ancestors of Mrs. Sodersten came from the Isle of Wight. In the early days Mrs. Sodersten with her parents fought the prairie fires to save their home and grain, and experienced other hardships incidental to those times. Mrs. Sodersten was one of the first to attend school in the first school district organized in Antelope county, Nebraska. George W. Greenwalt is one of the pioneer homesteaders of Custer county, Nebraska, and has witnessed the development of the country around his home from the time he located there, nearly thirty years ago, until the present time, and during this period the region of sod shanties, where the land was mostly devoted to the cattle ranch business, has changed to a region of fertile farms and comfortable farm homes. He was one of those who found it necessary at times, in the early days, to use a coffee mill to grind a little grain for making bread, and when he came he had almost no cash to invest, but made his start in life by his own efforts and did his full share, at the same time, to assist the general development and improvement. He is a native of Dayton, Henry county, Illinois, born January 18, 1862, next to the youngest child of John and Caroline (Goodman) Greenwalt, who were parents of four daughters and two sons. Mr. Greenwalt was the older of the two sons in the family, and the brother, Daniel, resides in Kimberley, South Africa. An elder sister of Mr. Greenwalt, Mrs. A. R. Doolittle, lives in Portland, Oregon. Mr. Greenwalt lived in his native state until his eighteenth year, and June 20, 1880, came direct from Henry county to Custer county, Nebraska and began working on a ranch in order to learn the cattle business, the country at that time being given over to large ranches. He became an expert cattleman and also rode the Wyoming range in the same capacity. He has traveled extensively and crossed the continent four times, and is well informed on a variety of subjects. In the spring of 1883 Mr. Greenwalt took up his present homestead on the southwest quarter of section eight, township seventeen, range nineteen, and has since lived continuously on this place. He has developed and improved his estate and now has four hundred acres in this property, devoting considerable attention to stock raising and handling a large herd of cattle. He has been actively instrumental in promoting the welfare and development of his part of the county and has served in various offices of public trust. During the years 1901-1905 he served as county commissioner. He is unmarried and realizes to the full extent the difficulties of holding a homestead under adverse circuimstances and pioneer conditions. He is one of the able and enterprising business men who have done so much for the region and has given freely of his time and influence for the betterment of his county and state. For over eighteen years the citizens of Pierce county have had in their midst a worthy citizen in the person of the gentleman above named. He has been identified with the development and growth of this section of the state of Nebraska, and has succeeded in building up a good home and an enviable reputation for himself, being highly esteemed by his fellowmen. the old country, and Katrina Braun, also a native of Germany. When starting for America, Mr. Pfanstiel sailed from Bremen to New York in the ship "Hapsburg," which was ten or twelve days making the voyage. Since his arrival here, he resided in Schuylkill county, Pennsylvania, three months, and in Chicago one month, going thence to Scott county, Iowa, where he was employed at farm labor four years. He worked in Sac county, Iowa, for one year, and then rented land for five years. He came to Pierce county in the spring of 1893, having bought land in section ten, township twenty-eight, range two, the fall before. This he improved at the time, and in 1903 built a large barn and the year following, a fine seven-room house, together with other necessary buildings. A view of his home place, surrounded by beautiful evergreen and forest trees, is to be found in this volume. He purchased a quarter-section in section fifteen, just across the road from his home place, in 1897, and has it improved with a good set of farm buildings, occupied by a tenant. At the time of his coming, this part of the state was all open prairie, without a building, a fence, or a single tree. All these have been added by the hands of those who came into the wilderness and remained to make it one of the most highly cultivated regions of the country. Mr. Pfanstiel was united in marriage February 24, 1888, to Miss Elizabeth Grantt, a native of Clinton county, Iowa, daughter of Henry Grantt. They now have a family of seven children, named as follows: Alvina, Adelia, Clara, Mary, Herman, Carl and Harry. Mr. Pfanstiel and family are members of the German Lutheran church, and he is independent in politics, casting his vote for the best man. Our subject went to his old home in Germany on a visit in 1903, remaining three months, when he returned to his family and home of adoption, where he is now enjoying the fruits of his early industry and thrift. 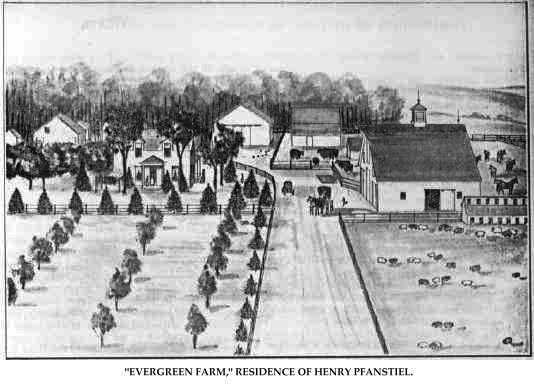 "Evergreen Farm," Residence of Henry Pfanstiel. 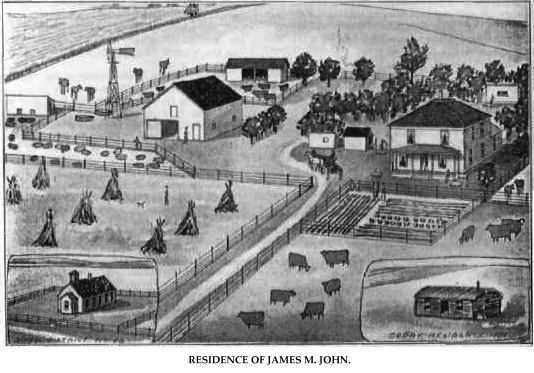 The John family were among the early settlers of Nebraska and the subject of this sketch and his venerable father, Samuel R. John, have long been identified with the development of the central part of the state. James M. John was born in Cedar county near Iowa City, Iowa, January 15, 1860. The father, Samuel R. John, was born in Carroll county, Ohio, June 14, 1830, the fifth of six children born to Abner and Hannah John. He was married August 25, 1853, to Eliza Auten they became the parents of five sons and three daughters, our subject being the third child. In 1855 Samuel R. John and wife moved to Cedar county, Iowa, and ten years later, to Sullivan county, Indiana. In 1874 they located near Loup City, Sherman county, Nebraska. They secured a homestead there, which they occupied until 1892, when they came to Valley county. They were among the pioneers of the section and made the trip by wagon from Sullivan county, Indiana, camping by the way-side during the five weeks necessary for the trip. The children of Samuel R. John and wife were as follows: Hannah Mary, married Willis Cadwell, of Polk county, Nebraska, and they have three children: Joseph, of Custer county, is married and has three children; James M., of this sketch; William D., deceased; David W., of Custer county, is married and has five children; Alvaretta, wife of William Leinenger of Sherman county, has seven children; Charles, of Valley county, is married and has four children; Ann May, wife of Fred Gould, of Custer county, has four children. In early life Samuel R. John followed the trade of carpenter in Indiana, but since he first located in Iowa has followed farming as an occupation. He was successful in this line and became prominent as a stock man. His wife died on the farm occupied by the son, James M., February 26, 1909, deeply mourned as a loving wife and devoted mother, and highly regarded by all as an earnest christian and a pioneer settler of the region. Mr. John lives with his son James and is now in his eighty-first year. He has been well-known as a pioneer in several states, has had many interesting experiences. He has done his part toward promoting the progress and upbuilding of every community where he has lived and has been especially active and helpful along the lines of education, morality and religion. He has the respect and regard of all who have been associated with him. James M. John accompanied his parents to Sherman county in 1874 and in his twenty-second year started in life for himself, becoming a farm hand. In 1884 he came to Valley county and secured a homestead on section three, township seventeen, range sixteen, where he has since resided. He had one hundred and sixty acres at first and now has a well equipped farm of three hundred and sixty acres of well improved land. He has always been interested in stock and has been especially successful in this line of farming. He is one of the best known farmers and stockmen of central Nebraska and is recognized as an able business man. rounded by their many friends and enjoying the respect and esteem of all who know them. Mr. John can well remember his bachelor days in a small sod house; after marriage he built a more commodious "soddy" in which they lived for about twelve years, and then built a frame house. Their present large dwelling was erected in 1908. We call attention to an engraving of their farm house adorning one of our illustrative pages. Both Mr. and Mrs. John have passed through the usual trials and hardships of the pioneer. The first and second year grasshoppers devoured their crops, three years drouth burned vegetation before it reached maturity, and hail beat their crops into the ground four different seasons; one year a cyclone moved their farm house seven feet. Fear of an Indian uprising drove them from home one entire season, but they returned after danger of an attack was past. In the blizzard of January 12, 1888, Mr. John returned home at five o'clock in the morning, just as soon as the storm had somewhat abated. Mr. John has seen elk, deer, and antelope, on the prairies, and his rifle secured some of them, supplying the family with fresh meat. In politics Mr. John is a republican. Residence of James M. John. Jasper L. Dennis lacked but little of being a native son of Nebraska, being under school age when his parents moved to the state in 1873. He was born at Monticello, Jones county, Iowa, October 25, 1868, and is a son of Lewis and Isabel (Woods) Dennis, natives of Illinois. Our subject's father, Lewis Dennis, served three years in the Twenty-seventh Illinois Volunteer Regiment during the Civil war, receiving a wound at Chattanooga and another at Lookout Mountain, which for a time laid him up in the hospital camps; and as soon as he was able to get out he served as company cook until he could take his place in the ranks again. He returned to Illinois and soon moved to Jones county, Iowa. In Iowa he followed farming, as he did in Cedar county, after reaching Nebraska. He migrated with his family, together with two or three neighbors, by wagon in the fall of 1873, settling on a homestead tract back from Ponca, Nebraska, where but two or three neighbors had preceded him. His first dwelling, a dirt covered dug-out faced with boards, was more elaborate than the usual dug-out of the early settlers. His first stable, was of slough grass covered with the same material. When he prospered sufficiently to build a good house and barn the lumber was hauled from Sioux City, Iowa, fifty miles away. His first ground was broken with oxen, of which he had several yoke, but his traveling was done with a span of mules, the first in that region in going to St. James on the Missouri river, for wood, his neighbors with their ox wagons started two hours in advance, he being able to make the twenty miles to the river in that much less time. The Dennis family were here in time to suffer by the grasshopper raids, losing all their crops several years, and part of their crops other seasons. At times when their supply of wood ran low, family burned hay and the heavy weeds that grew among the slough grass. Many deer and antelope were to be seen in the country and now and then a stray buffalo. The big grey wolf was accasionally heard, his cry being deeper and louder than the coyotes, but he was seldom to be seen. J. L. Dennis began farming for himself rented land about the time he attained his majority. After his marriage he rented the old home place and continued there until about 1895. Secured a place with the Peavey Elevator Company and represented them at Hardington, Nebraska, Delhi, Minnesota, and Magnet, Nebraska. He was stationed at Laurel, Nebraska, in the employ of the Sidnum Grain Company until 1900, when he was sent to Osmond. The year following they sold to the Anchor Grain Company and Mr. Dennis was retained in charge and continued in their employ until May 1, 1911, when he a accepted a position with the Osmond Farmers' Grain and Live Stock Association. Mr. Dennis was married in Coleridge, Cedar county, Nebraska, December 15, 1892, to Miss Vinnie Durrin, a native of Manchester, Delaware county, Iowa, and a daughter of Professor R. and Mary (Hoakum) Durrin. The father retired from teaching and engaged in the marble business, living at Wayne, Nebraska, at the time of his death, March 22, 1911. To Mr. and Mrs. Dennis, one daughter and three sons have been born: Eva, Cecil, Merit, and Harold.